We received a lot of response to the quiz this week and most people were able to figure the quiz bird out this week! 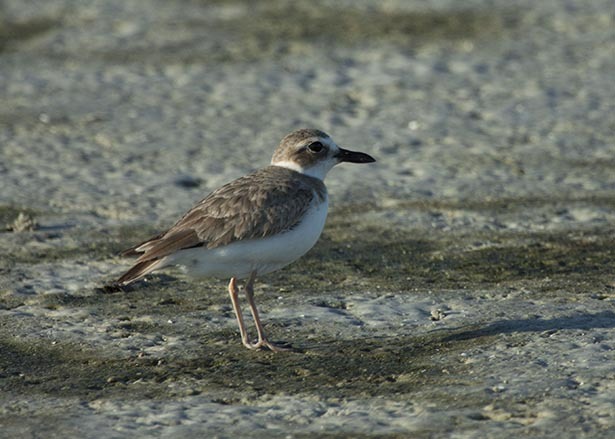 It was pretty easy for everyone that submitted an answer to decide that this was some species of shorebird and more specifically a plover. Killdeer can be eliminated by the lack of any dark banding on the neck, this also helps us to determine that this bird is in nonbreeding plumage. Piping, Semipalmated, and Snowy Plovers can all be eliminated based solely on the gigantic size of the bill on the bird in this photo. We also know that both Piping and Plovers would be a significantly lighter color on the back. Our only option that we are left with is the Wilson's Plover. The third quiz for March is posted here http://nuttybirder.com/BirdQuiz/birdquiz.html#.UUYWnRx-qSo.